CanwaxWest (CWW) is now accepting submissions for Waxing Poetic 2018. 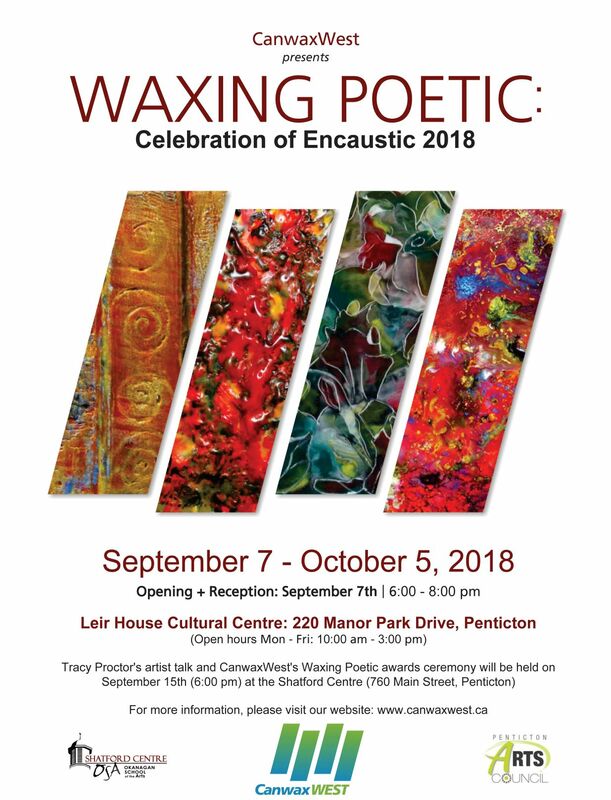 This celebration of encaustic painting will exhibit at Leir House from September 7th to October 5th, 2018. Waxing Poetic is an open show and juried for prizes. CWW wants to encourage all artists working with encaustic, from every experience level, to submit their work to CWW shows. The CanwaxWest awards presentation will be held at the Shatford Centre’s Okanagan School of the Arts on September 15, 2018. All submissions are to be sent to Mandy Rollins at rollinsmandy@gmail.com by September 3, 2018. Please include “Attn: Waxing Poetic 2018” in the subject line of your email. Each artist can submit up to 2-3 works, size dependent. Please connect with Mandy at the email above if you have questions or concerns about the size of your work. Include the Waxing Poetic submission form and sales agreement, at the end of the document, along with your up to date artist biography and statement. If you are shipping your art, please email these items as well as including a printed copy with your paintings and payment. If you are dropping off your art, please bring them with you. Note: We do not require photos of your work when submitting as the paintings are not juried in into the show and all submissions are welcome. Once hung for the exhibition, the paintings will then be judged by our jury committee for category awards. Name, title, size, medium, price. Deadline for Entry: September 3, 2018 at 4:00 p.m.
Painting Drop Off: September 7th between 10:00 and 11:00 a.m. If shipping your art, please see “Delivery of Art” below for details. Mailed in submissions must arrive at Leir House by Sept 6, 2018. Entry fee: $10:00 per person, cash or cheque made out to CanwaxWest. Pay in person on the drop off day or if your mailing your submission, please include entry fee in packaging. Commission: Leir House takes a 20% commission on artwork sold. Painting Take down / Pick-up: October 5th between 10:00 and 4:00 p.m. All works mailed in will be packed up this day, in your original packaging, using prepaid label provided by you or shipped by the way it arrived i.e. FedEx or other. CanwaxWest Awards Presentation: September 15, 2018 at the Shatford Centre School of the Arts (760 Main St, Penticton). The awards ceremony will be held after Tracy Proctor’s artist talk which takes place at 6:00 p.m. See the CWW website for details. Artwork must be properly labeled on the back with artist name, address, phone and email, title and price. Artwork must be professionally framed or displayed, and ready to hang. Any art that is not ready to hang will not be allowed in the show. Do not use sawtooth or sticky tab hangers. All works must arrive and leave on the dates as indicated in this document. Artists submitting works to the show are responsible for insuring their own work. By entering your work into CanwaxWest’s Waxing Poetic you are agreeing to allow CanwaxWest to use images of your works submitted for publicity purposes for Waxing Poetic 2018 and future Waxing Poetic exhibition advertising. Artists can drop off their paintings before September 7th. Sharon will store them at Leir House until they are hung. Please have your art labelled and $10 clipped to the info sheet. Sharon will also accept mail in paintings at the Leir House but you must make sure your artwork arrives by September 6th. The show will be hung on September 7th. Completed sales agreement form must be included with artwork when shipping or in person on the drop off day. Please include a return-shipping label with your work, the same size as the original label, and this will be applied to your package before being returned. You are responsible for paying the return shipping of unsold art. If you ship via Greyhound Courier, you can send it COD. You must state 'return shipping to station” for this to apply. Each painting will be returned via the same carrier used from the initial shipping. Please obtain a prepaid return-shipping label. If using an alternate method of shipment (Canada Post or UPS) please attach a personal cheque, made out to CanwaxWest, to cover the cost of return shipping to the outside of your shipping box. If your painting sells we will shred your cheque. Individual works MUST be wrapped in parchment/wax paper/glassine envelope. Place this into a bubble wrap envelope that you create to fit each work with your name and the title of the artwork written on the front of it. This envelope should be large enough to allow the wrapped artwork to be easily inserted. As our members will be repacking the artwork for return to the artist, please do not use packing tape to seal the envelope but make the envelope with a flap. This envelope can then be put into a heavy-duty cardboard box. Please make a box for each artwork being shipped. Thick sheets of foam insulation to guard your envelope against heat/cold and against shock are recommended. The artwork should sit securely in the box (i.e. put foam insulation surrounding the bubble pack envelope to fill up any extra space in the box). To ensure safety, shake the outer box vigorously. If you feel the artwork moving, add more packing material. PACKING PEANUTS ARE NOT ALLOWED.